Holmes Harbor is a residential community on Whidbey Island located in Green Bank overlooking the entrance to Holmes Harbor, Saratoga Passage and Baby Island. With Holmes Harbor waterfront real estate, you’ll not only enjoy spectacular views, but private beach access and trail access at historic Greenbank Farm, once the largest loganberry farm in the world, now home to Greenbank Cheese, Whidbey Pies, a winery and wine shop that produces renowned famous Loganberry wine as well as a wide range of other wines, including local award-winners, hard cider, jams and syrups. Living here, you’ll be able to harvest oysters and clams, including butter, cockle, Manila, native littleneck and eastern softshell, just steps from your door, or toss out a crab pot and pull up a crab feast. You’ll also have easy access to kayaking, canoeing, paddle boarding and boating, with the community itself offering storage for non-motorized, manually propelled vessels. Whale watching is a popular activity too, with orcas, gray whales and the occasional humpback passing by. Holmes Harbor waterfront real estate offers the chance to enjoy the best of island living, surrounded by nature, but you’ll be able to pick up groceries with just a 5-minute drive in Freeland, while a myriad of options for shopping and dining can be found just a short drive away in Oak Harbor and Coupeville. When you need to get to the mainland, the Clinton-Mukilteo ferry is just a 20-minute drive away, making this area ideal for commuters too. Holmes Harbor waterfront real estate typically includes a mix of options, with everything from vacant lots and modest abodes to lavish estates with a long list of luxurious perks and the opportunity to watch annual fireworks displays right from your yard as well as enjoy relaxing among the jaw-dropping water and mountain views. Take advantage of our industry-leading tools to make your property search as easy as possible and be sure to register for a FREE account so that you can receive email alerts whenever new Holmes Harbor real estate for sale hits the market. 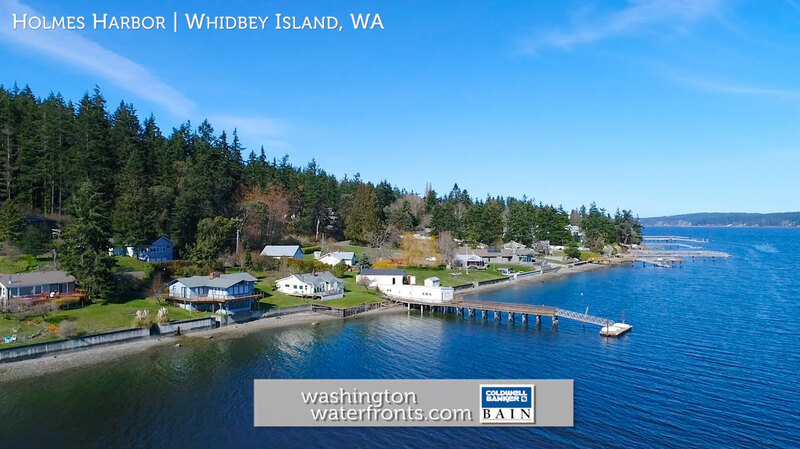 If you’re seeking to sell your Holmes Harbor property, contact our Waterfront Specialists directly for a comprehensive listing analysis and to learn more about the cutting-edge marketing strategies we’ll use to sell your home quickly for top dollar!